Sydney Samples is a Saydel graduate, Class of 2015. This fall she will be starting her junior year at Simpson College and double majoring in Environmental Studies and Spanish, with a minor in Political Science. 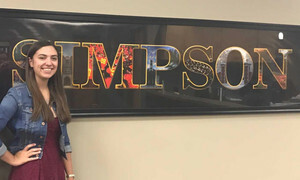 During her time at Simpson College, Sydney has been involved in many activities including: Sustainable Club, Speech and Debate, Kappa Kappa Gamma sorority, Light Company, and the Student Government Association. Through Speech and Debate, Sydney has traveled and competed in two types of debate, receiving awards at many competitions, including at Nationals both years. Sydney was also elected the youngest Student Body President in Simpson College’s history. During her time as President she has been very active, including helping plan a prairie reconstruction project right off of campus. Recently Sydney was named a Newman Civic Fellow, a national fellowship awarded to civically engaged college students, and will be attending a national conference in Boston in November. She plans to go to graduate school and study environmental policy or international relations and sustainable development and one day work in international environmental activism. Sydney would like to thank Saydel School District for helping prepare her for college. She would also like to thank Mrs. Smith and Mrs. Fokken for always believing in her, challenging her, and kindly giving up their time to lead extracurricular activities after school. Both NHS and mock trial helped prepared Sydney for debate and leadership roles in Student Government and for this she is very thankful. 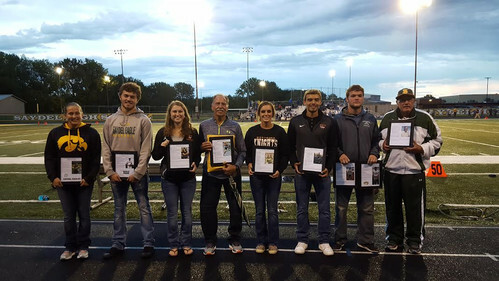 On Friday, September 9, 2016 – Saydel High School inducted 9 new members into our Athletic Hall of Fame. These additions took the total number of Hall of Famers from 36 to 45 members. The afternoon started with a Pep Assembly at the High School, where the inductees were introduced to the students and staff members. The inductees received a warm welcome from the student body and community members in attendance. Following the assembly the inductees and their families all attended an Honors Dinner at Smokey D’s restaurant. Forty-four people attended the “Hall of Fame Honors Dinner.” The dinner was highlighted by Activities Director Ric Powell welcoming the attendees. Powell congratulated the inductees and their family members. Many coaches attended the dinner and were asked to speak about their former star athletes. Following the honors dinner, the group moved to Saydel Stadium for the Pre-Game Ceremony before the Varsity Football game with Dike New-Hartford. The nine honorees walked through a tunnel that consisted of Saydel Cheerleaders, Marching Band & Color Guard Members, along with coaches and family members. One by one, each inductee was honored by walking through the “Celebration Tunnel” that ended with congratulatory hand shakes from: Craig Wederquist (Hall of Fame Chairman), Ric Powell (Activities Director), Kevin Schulte (Principal) and Doug Wheeler (Superintendent). Prior to the kickoff of the Varsity Football Game, the 9 inductees participated in the Pre-Game coin toss as “Honoring Captains” at midfield. It was a great night for the Saydel Community. The new Rube Goldberg Machine Club has spent the last semester building the 12 boxes of the machine, and will take the piece to a world competition in March 2015. Iowa State College of Human Sciences' Students were selected to work for Precision Meetings & Events, Inc. to help with American Israel Public Affairs Committee (AIPAC) Policy Conference in Washington, D.C. March 1-3. 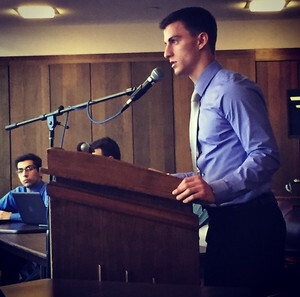 Saydel High School Graduate Daniel Breitbarth, son of Paul and Dianne Breitbarth, has been named as the 2015 President of the Government of the Student Body (GSB) at Iowa State University in Ames, IA. He will be a spokesperson and leader for approximately 33,000 enrolled students at the university. The mission of the GSB is to serve all students and improve their college experience through advocacy and empowerment. Daniel campaigned on several issues, including increasing campus parking and making sidewalks on campus safer for students. He has already been working on accomplishing goals, including Veishea and overcrowding. Daniel is majoring in business economics and management. He is expected to graduate in 2016. He is from Saylorville, IA, and he was the President of Willow Hall during his freshman year at ISU. Daniel has also served on IRHA and was a part of the Leadership Committee. While a part of IRHA, he helped in the passing of legislation such as rentable projectors for Willow Hall and the leadership retreat for residence hall students. He is also a part of the Iowa Statesmen, ISU’s male choral group, and Business Council. During his first full year on GSB, Daniel was a part of the University Affairs Committee and served as Vice Chair of the committee. He worked on several important projects and many financial funding bills for student organizations, but primarily focused on the addition of a walk path near Linden Hall and the renovation of the HUB. Daniel is interested in developing a more unified College of Business and continuing to improve student involvement in the university’s decisions. He loves problem solving and is always looking for new student projects to take on. Daniel is looking forward to working as an intern this spring at Senator Chuck Grassley’s office. Congratulations to Daniel on his new leadership position!